I have switched urls to begin my new school year. My school board offers a multi user network so I have decided to switch to that area. I hope that all of the visitors that have been checking my blog out will switch over to the new one. My students love seeing where our the visitors to the blog live around the world. It will take me awhile to get the new blog running the way I had this one running. I have to figure out how to get my RSS feed working…amongst other things. But, I hope that you will find it worth the wait! I can’t wait to jump right in and get started sharing with and learning from my students this year! I may eventually return to this location and revamp it to become a site for my professional musings etc. But for now, I will leave it active so that students and guests to the site can still refer back to it. 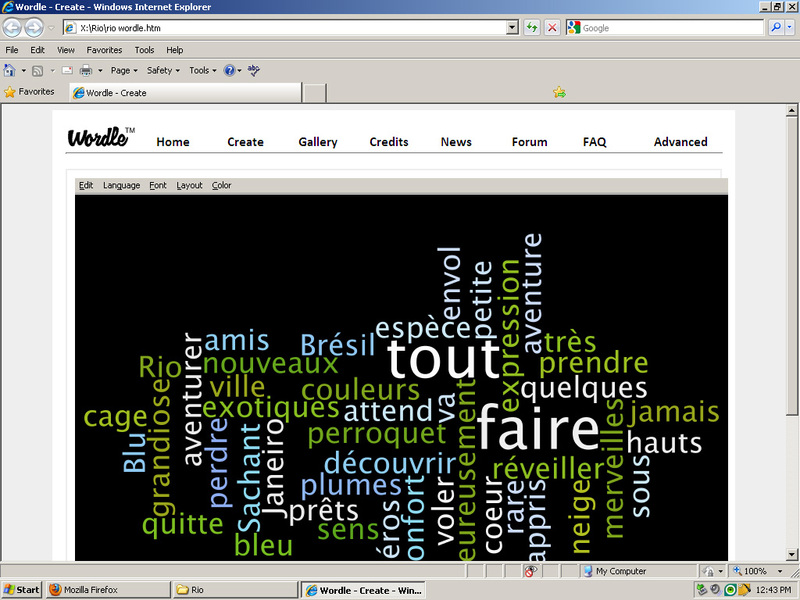 Voici un wordle que j’ai fait en utilisant une sommaire du film “Rio” pris de ce site. We used this wordle to discuss some important words related to the movie so that the students would have an idea of a bit of the content before we watched some “trailers” for the movie. Then we watched some trailers (des extraits) of the movie applying the strategies that we had discussed. Some were in French, and we watched a few others too. un petit vidéo pour voir des “voice actors” qui parlent et chantent dans le film. We can’t wait to go and see this movie! I’m so excited for my students to get to see French in action in a really fun context! 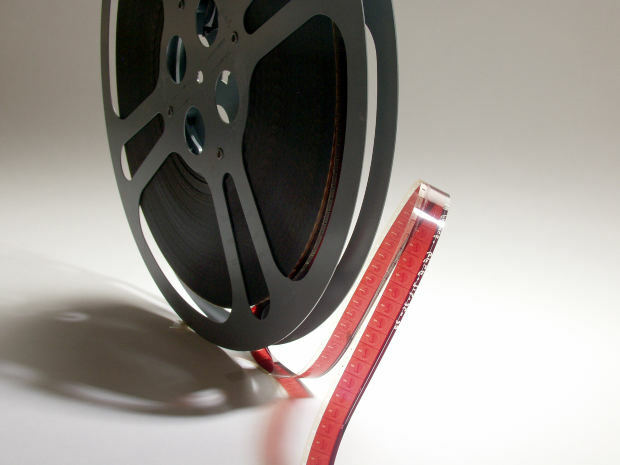 When French is your second language it can often be intimidating to watch an entire movie or video in French. I will be taking my students to see a French movie in the near future so we have been reviewing viewing strategies. I would like them to feel comfortable watching a movie in French, despite the fact that the dialogue might happen very quickly. We brainstormed some strategies that might be helpful when watching a movie in French (or any second language). * Look at the pictures / animations and try to figure out what is happening. * Watch the expressions of the characters and pay attention to their body language to help you understand the movie. * If at home you could choose “French subtitles” on your DVD player. * If at home you could watch the movie in your first language before viewing it in French. This might help improve your understanding. * Use your prior knowledge to help you understand the movie. Listen for words you know already (les mots connus) and for words that sound like English words (les mots amis). * DON’T STRESS OUT if you don’t understand every word!!! Focus on listening for words you know, watching the action in the movie, and trying to piece together what’s happening. * Enjoy the movie and enjoy practising French in a really fun way!!! Lisez l’article et regardez un vidéo ici. Voilà un lien qui décrit le 13 vendredi. There’s a radio station in French for kids on this site but you can click on the stop button at the top and then go back to the Friday 13th page. Comment est-ce qu’on peut trouver l’idée principale d’un texte? Remember to study for your quiz! Here are some links to help you study ir verbs. You will be conjugating the verb as well as writing some sentences which include ir verbs. We reviewed in class how the grade 6’s will be expected to include adjectives and or conjunctions to give more complexity to their work. Remember to study for your quiz! Here are some links to help you study the verb avoir. You will be conjugating the verb as well as writing some sentences which include avoir. We reviewed in class how the grade 5’s will be expected to include adjectives to give more complexity to their work. How do you conjugate / change the verb avoir? Merci à Mme Duckworth qui a trouvé ce vidéo.